The Foyer (known as Entrance in a pre-release version) is the entrance to Luigi's Mansion in the eponymous game. When Luigi first explores the mansion, he finds that the door to the Parlor is locked. He then hears a ghost cackle. He heads downstairs and sees a Gold Ghost, who drops the key to the Parlor. Later on, when Luigi gets the Poltergust 3000, he finds Toad crying over Mario's absence. After Luigi tells him that he will find Mario, Toad becomes happy, and the room's lights turn on. 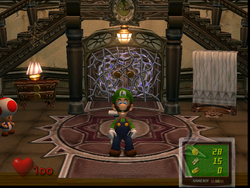 Luigi never encounters any ghosts in the Foyer, even during the blackout (except for the Gold Ghost that drops the key to the Parlor at the start of the game). All the mirrors (except for the one in the Mirror Room) link to the Foyer, including its own mirror. In the remake, Luigi can go back to E. Gadd's lab at any time by exiting through the entrance. This is, however, impossible during the blackout due to a "mysterious force" blocking the entrance. The Foyer in the Nintendo 3DS remake. The Foyer is the only room (excluding hallways) to have two floors. At first, the door on the first floor is blocked by a force field and requires a special pink key to disappear (which is obtained by defeating Chauncey). The second floor's north doors lead to the Parlor, while the west door leads to a hallway with the Study, Master Bedroom, Nursery, and The Twins' Room. Just above the entrance's rug is a big chandelier. If Luigi steps underneath it, it spins and falls to the floor. (Luigi gets injured if he is hit by it.) He can then hear Chauncey's laugh, implying that he caused the chandelier to fall to the ground. After Luigi completes Area 1, more specifically, defeats Chauncey, the chandelier no longer collapses to the floor, trying to hit Luigi. 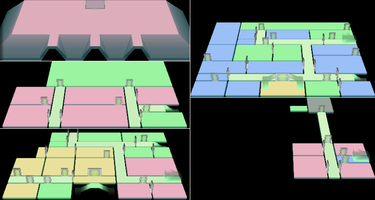 Mansion Patrol, one of the minigames of Super Paper Mario, takes place inside of an area which resembles the Foyer. Between Area 2 and 3, if the player talks to Toad, he will tell him that he saw a big Boo fly around, which signifies Boolossus. The pause screen shows an image of the Foyer reminiscent of the scenes in the Space World 2000 trailer. This page was last edited on January 22, 2019, at 21:02.